"Tarpon Fishing Charters in Miami at Their Best"
Each year the Miami and Miami Beach area plays host to what can be considered one of the most well guarded secrets: world class tarpon fishing action that surprises even the most experienced, avid tarpon anglers. During the January through June time frame the warm waters of Miami and Miami Beach are filled with various baits. This does not go unnoticed by the mighty tarpon and they are here to enjoy the feast of the easy to catch meals. Those in the know take advantage of this top notch tarpon action. Whether you are local to the Miami or Miami Beach area, or travel long distances to get here, the trip is well worth your while to tangle with the brute size, strength, and stamina of the mighty silver king. Captain Dave Kostyo of Knot Nancy Fishing Charters, Inc. has, for many years, experienced this great winter/spring tarpon action. 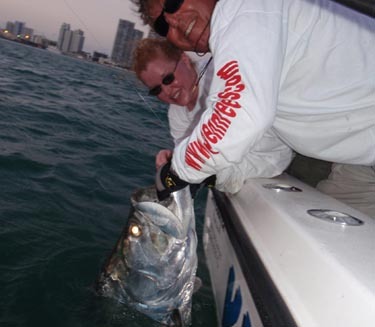 He has guided many, very satisfied, anglers with all levels of experience, to outstanding tarpon action. Your Miami tarpon fishing charter begins at TNT Marine Center located at 1940 N.E. 135th Street, North Miami, Florida 33181. From there, depending on the time of year, it’s a quick run to the tarpon hole at Haulover Inlet or a slightly longer run to great tarpon fishing at Government Cut. At either Inlet, your Miami tarpon fishing charter with Captain Dave will put you at the best locations for the best chance at multiple shots with the silver tarpon. Make no mistake, the tarpon is mean, nasty, and has a never give up attitude that will test your strength, stamina, and angling skill. Leave no doubt in your mind that your Miami tarpon fishing charter will leave you wanting to come back for more and more. If you’re concerned about being out on the water after dark during your charter, there’s no need to worry. The tarpon are located close to the shoreline and unless they decide to run offshore a bit, we are usually never more than a ¼ mile out. Often we are just outside of the swim markers. We are so close, that many times during your Miami tarpon fishing charter you can hear the conversations of people taking a stroll along the beach, hear the music from the hotels, or smell the food being cooked in the condos or at beach parties. Also, the boat is well lit, with side lights facing forward, aft, port, and starboard, as well as hand held spot lights to light up all the antics of the tarpon. The sight of water shimmering off a tarpon as it makes it’s jumps is a beautiful sight to see. During your Miami tarpon fishing charter, if you are fortunate enough to be out on a night when the shrimp run, you’ll be treated to sights and sounds that you will not soon forget. Hundreds and thousands of shrimp are moving with the tide and the tarpon are in a feeding frenzy. Explosions can be seen all around the boat and the slurping sounds of hundreds of tarpon having a feast is sure to get your blood boiling. Then a rod slams over and the clicker screams as line is pulled from the reel at an alarming rate. Often times another tarpon will grab the second rod and things get a bit crazy with two angry tarpon hooked up. 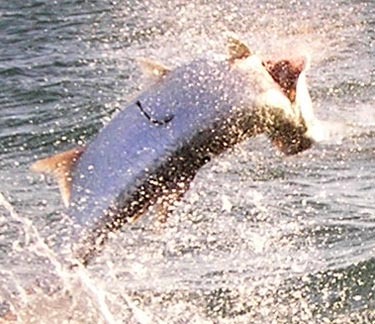 Want to try what I refer to as Gorilla Tarpon fishing during your tarpon fishing charter? Then ask us about catching them in the Bay. This is a highly specialized fishery that is very dependent on the tide. To catch the right tide for this tarpon fishing charter, you might have to fish the late hours of the night or wee hours of the morning, but if you’re willing to do so, the action can be fast and furious. The tarpon lurk in the shadows waiting for an easy meal to come along. Once hooked, it’s up to you as the angler to keep the tarpon away from the many obstructions that it can cut the line on. That means tighter drags and more muscle power on your part, hence the phrase Gorilla Tarpon Fishing. 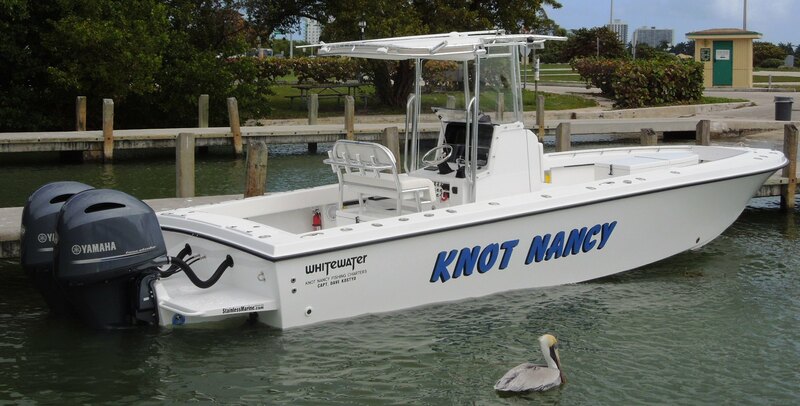 Soon after buying a 25’ custom built Whitewater that he named Knot Nancy, he obtained his Coast Guard Captain’s License, established Knot Nancy Fishing Charters, and started taking out private charter groups. In time, he upgraded his boat to a 28’ Whitewater, equipped with all the necessary electronics. As his fishing experience grew, Captain Dave was fortunate to acquire numerous sponsors: Whitewater Boats, Penn, Yamaha, Pure Fishing, and Simrad Electronics. These sponsors ensure that his fishing ‘tools’ are diverse and plentiful. Captain Dave has the benefit of being a fulltime fishing guide and commercial live bait supplier; this has, consistently, provided him with the ability to find fish when they are being uncooperative. By choosing Captain Dave, you can take advantage of his countless amount of, “on the water”, time and greatly increase your opportunity to catch that tarpon of a lifetime.